It took several repeats before the penny dropped. Where had I heard the name Bamako before? Where? I have had an ambition to climb the Kaga Tondo in Mali for over 6 months now that was inspired by an article in Summit magazine about the 10 “must climb” peaks in the world. 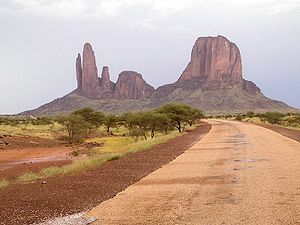 The Kaga Tondo, the tallest of the five fingers of the Hand of Fatima formation in Northern Mali just looked so very very, very cool. More importantly it was within my very average climbing abilities. I have had my eye off it for a few months now in the drive to get a job and the small fact that I’d need at least £2k. Additionally, the only time to really attempt it is when it is a freezing 30-35 deg C in the desert daytime. That’ll be Jan/Feb 2013. The Kaga Tondo is the tall skinny one. Now, with just a month to the presidential election there has been a military coup in Mali overnight. Bamako is the name of the capital city in the South. The South was supposed to be the safer part of Mali and the FCO don’t advocate travel in the North whilst the Canadians seemed far more laid back about it 6 months ago – as Canucks often are – so I thought I’d go in my guise of a Canadian and hope any marauding Touraeg’s intent on kidnapping a worthwhile Western trophy wouldn’t spot my mostly British accent and consider that, as a Canadian, I was a worthless Bob & Doug style hoser. Although things have changed as of late… Now the entire venture seems far too fraught with hazards, which is deeply disappointing. I don’t fancy being kidnapped and possibly shot because I don’t think that I have rich enough friends to raise a decent ransom. PS: Interesting fact about the Kaga Tondo… The first Westerner (Todd Skinner I think) to summit the 1600 metre formation found clay pottery on the top….do the math! Just chatted with a few more peeps and none of us has the taste for dodging kidnappers. Pah, I’ll wait.